“Paris” [= Amsterdam], “imprimé â l’imprimerie royale du Petit Louis” [= Carel Allard, 1706?]. Small folio (32 x 21 cm). 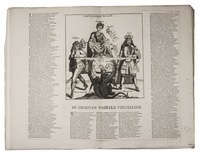 Engraved print series with an engraved title-page and 24 engraved prints (9 single-page and 15 double-page; 18 bound in and 6 loosely inserted), the double-page prints with extensive letterpress text flanking and/or below the engraving. 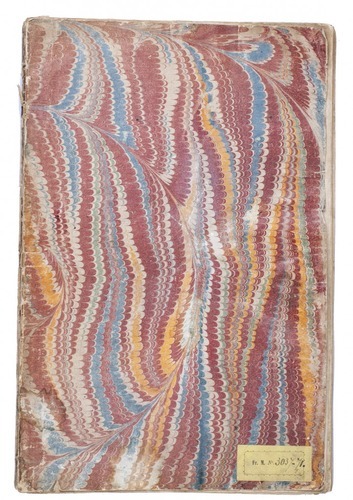 Contemporary marbled-paper wrappers. 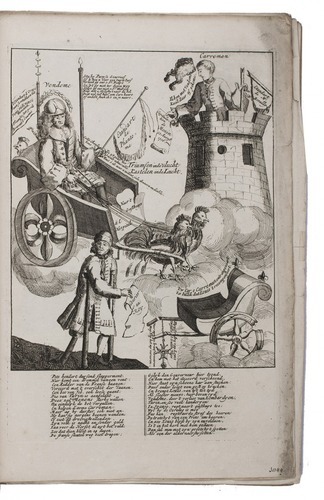 Extremely rare complete emblematic print series (plus alternative versions of several prints) mercilessly satirizing and ridiculing King Louis XIV of France, his grandson King Philip V of Spain, the Marquise de Maintenon (whom Louis XIV had secretly married after she had been his mistress for years), many others in Louis XIV's court and his allies in the War of the Spanish Succession (1700/01-1714). 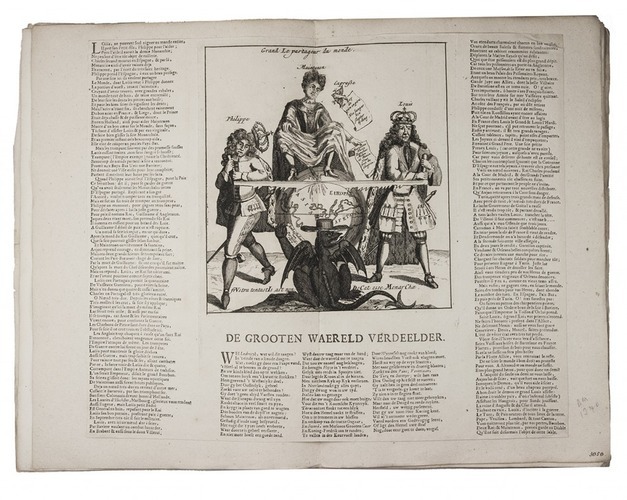 Most prints, like the title-page, have texts in both Dutch and French. 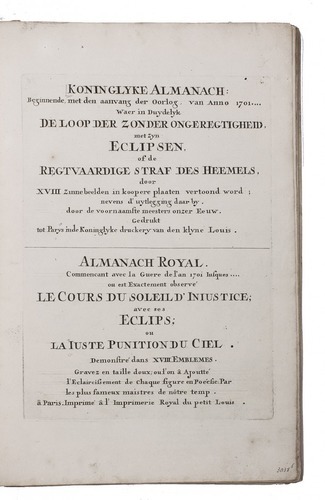 The title and many of the prints gleefully note the total eclipse of the sun that occurred on 12 May 1706, supposedly the day Philip V abandoned his siege of Barcelona (which had been taken by the British six months earlier), presenting it as the total eclipse of the Sun King. In 1877 Muller noted the "great rarity" of all these prints, surviving in far fewer numbers than satirical prints of poorer quality and less importance. "Their value as expressions of the spirit and life of the common people is inestimable: indeed, there is almost no period in our history for which we possess such a rich treasure of prints." 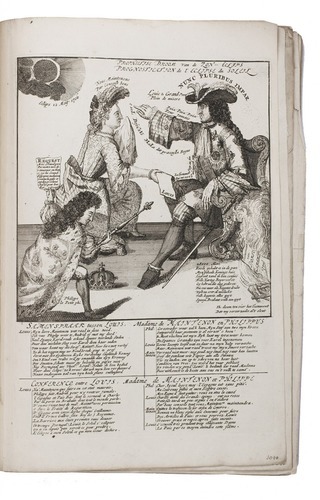 They also influenced the better known series on the 1720 South Sea Bubble, two of the present prints serving as direct models for prints in that series. 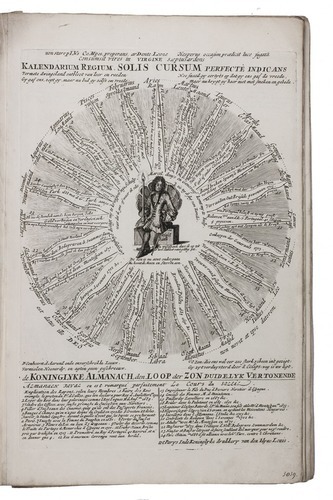 The title-page attributes the emblems to "the leading masters of our century" and some of the plates have been attributed to Romeyn de Hooghe and/or someone from his school, Laurens Scherm and the publisher Carel Allard himself. Although no two copies of the print series have the same makeup, and many of the emblems exist in variant forms, the present set of prints includes the engraved title-page, at least one of each of the 19 emblems noted by Muller, and two versions of some, so it may be called "complete". The present copy includes a major variant not recorded by Muller (or elsewhere). With 6 prints loosely inserted, 3 of them with a slightly tattered fore-edge, 1 also with a marginal tear along an old fold repaired with tape, and 1 bound print slightly browned, but still generally in very good condition. The spine of the marbled wrapper is mostly lost and the sides rubbed, with a few small and minor tears and stains, but the binding structure remains sound. 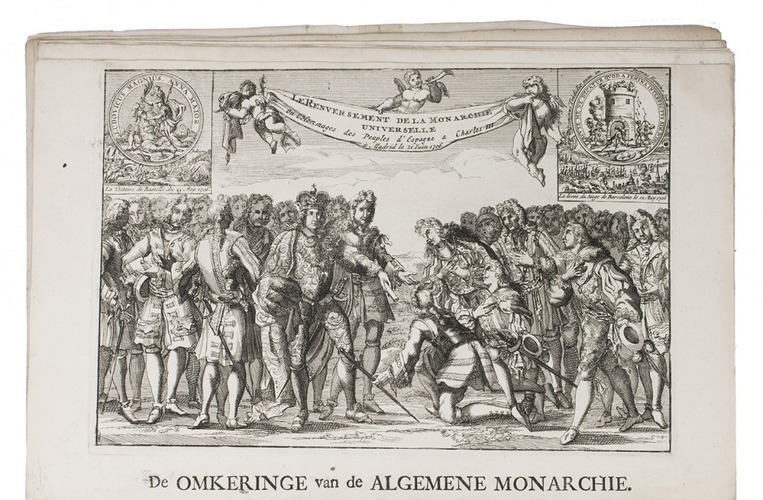 One of the best and most extensive copies of an extremely rare and important popular satirical print series from the War of the Spanish Succession. 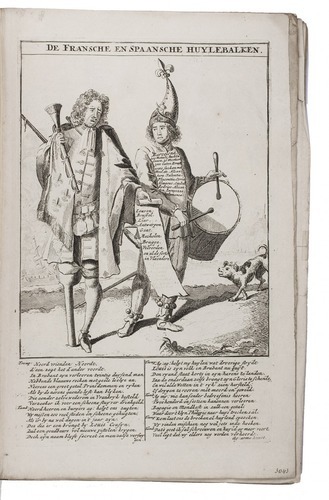 Atlas van Stolk 3182; Brunet I, pp. 194-195; Cohen, col. 28; KVK & WorldCat (3 copies); Muller, Historieplaten 3038-3071.